In a dramatic climax to the 2010 Men’s World Junior Team Squash Championship in the Ecuador capital Quito, top seeds Egypt beat defending champions Pakistan 2/1 to win the World Squash Federation title for the third time since 1994. New world individual champion Amr Khaled Khalifa put the favourites into a commanding position in the tie after beating Pakistan number one Danish Atlas Khan 11-3, 11-9, 11-3 in a victory which marked his tenth successive win in the two-week-long championships. But second seeds Pakistan charged back into contention when Nasir Iqbal ended Ali Farag‘s unbeaten run in the team event by overcoming the individual championship runner-up 11-8, 6-11, 11-7, 2-11, 11-8 in a 65-minute encounter to level the tie. But it took a further nail-biting 50 minutes before the destination of the title was resolved – when 17-year-old Marwan El Shorbagy repeated his individual championship bronze medal win over Farhan Zaman to beat the 18-year-old Pakistani 11-5, 4-11, 11-9, 11-9. It was a glorious conclusion to the championships for Egypt – who not only claimed all the medals in the individual championship, but now hold all four main world team titles, the men’s and women’s senior and junior crowns. Fifth seeds Canada celebrated their best finish in the championship since 1992 after upsetting third seeds and former champions England 2/1 in the bronze medal play-off for third place. India also claimed a 2/1 victory in the fifth place play-off – but it proved a notable conclusion for runners-up New Zealand, the 11th seeds whose 6th place is their best finish for 18 years. There was further cause for celebration in the Korea camp when the 16th-seeded team, in only their second appearance in the championship, beat Colombia in the play-off for 13th place – thus finishing 16 places higher than in their 2000 debut. Egypt and Pakistan will line up in the Men’s World Junior Team Squash Championship final for the fourth time in a row since 2004 after the two top seeded teams survived the semi-finals of the World Squash Federation event in the Ecuador capital Quito in contrasting styles. 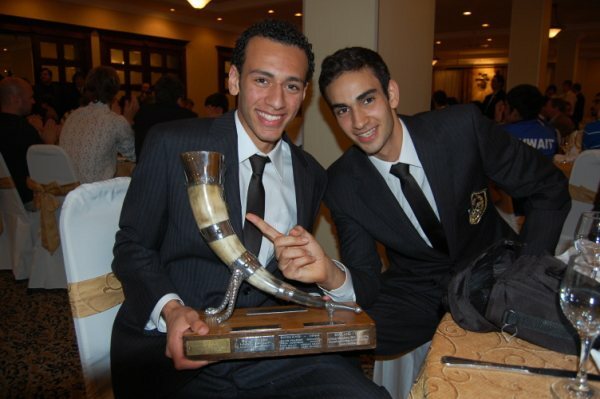 Favourites Egypt – with a squad featuring the players who won the gold, silver and bronze medals in the earlier individual completion – defeated surprise opponent Canada, the fifth seeds, 3/0. New world individual champion Amr Khaled Khalifa recovered from a game down to beat Canadian number one Andrew Schnell 7-11, 11-7, 11-7, 11-4 before bronze medallist Marwan El Shorbagy took out the third string Canadian Arjun Gupta 11-13, 11-6, 11-3, 11-9. Ali Farag, individual championship runner-up, ensured maximum points for Egypt by despatching Nick Sachvie 11-1, 11-8 in the best-of-three dead rubber. The win takes Egypt, champions in 1994 and 2006, into the world final for the eighth time since 1994. Title-holders Pakistan had a harder time claiming their anticipated place in the climax, having to fight back from a match down to beat former champions England, the third seeds, 2/1. 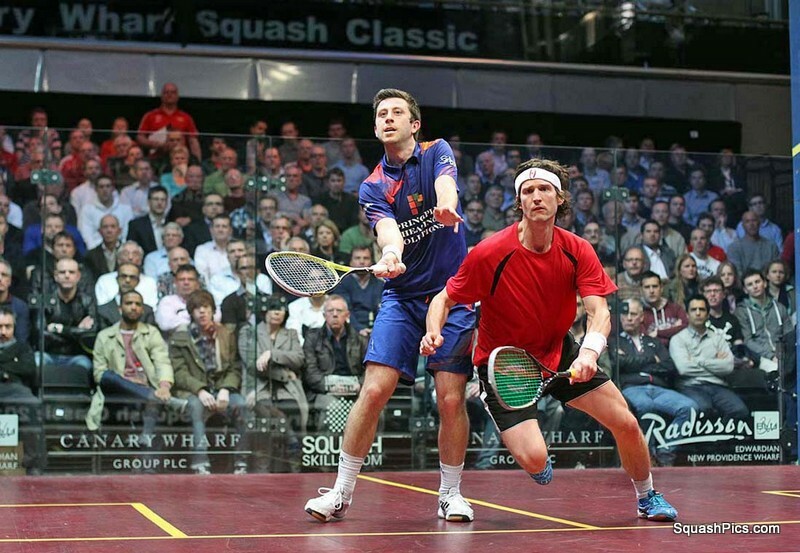 Squad number one Charles Sharpes raised England’s hopes with a battling 9-11, 11-5, 4-11, 11-5, 13-11 win over Pakistan’s Danish Atlas Khan in the opening clash. Farhan Zaman restored order for the second seeds when he beat England’s James Earles 11-7, 9-11, 11-9, 11-4. The decider was a dramatic 55-minute affair which lasted four games – but it was the Pakistan number two Nasir Iqbal who prevailed, defeating Nathan Lake 11-8, 11-5, 11-13, 11-7 to put the four-time champions into the final for the eighth time since the inaugural championships in 1980. Canada upset fourth seeds India in the quarter-finals of the Men’s World Junior Team Squash Championship in the Ecuador capital Quito to ensure a top four finish in the World Squash Federation event for the first time since 1992. Squad number one Andrew Schnell, 18, from Calgary, put the fifth seeds into the driving seat with a commanding 11-5, 11-9, 11-4 win over India’s Aditya Jagtap. 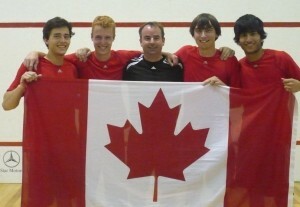 Team-mate Nick Sachvie clinched Canada’s place in the semi-finals by beatingRavi Dixit 11-7, 11-7, 11-4. India gained a consolation point when third string Ramit Tandon dismissed Canadian Arjun Gupta 11-2 11-1 in the ‘dead’ third rubber. Canada now face favourites Egypt for a place in the final. Fielding the players who won the gold. 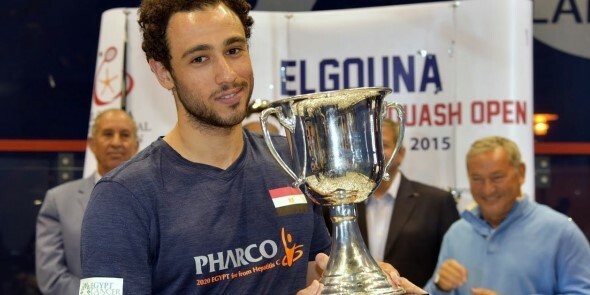 silver and bronze medals in the earlier individual completion – Amr Khaled Khalifa, Ali Farag and Marwan El Shorbagy, respectively – Egypt brushed aside seventh seeds France 3/0. Defending champions Pakistan and former champions England will line up in the other semi-final. 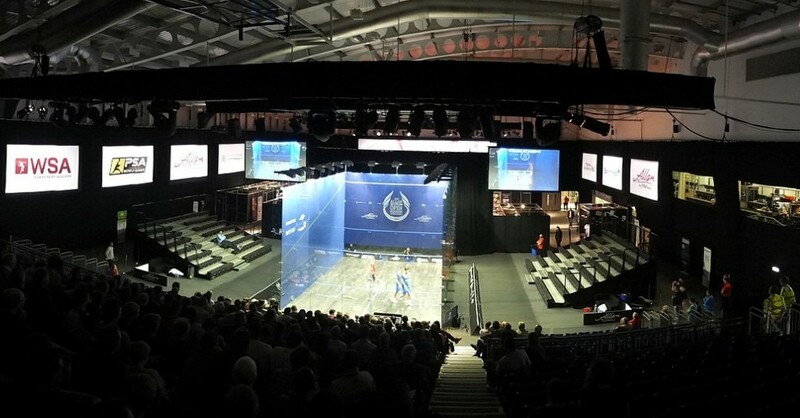 Pakistan, the second seeds, crushed Germany 3/0, while four-time champions England, the third seeds, defeated outsiders New Zealand 3/0 – but only after Nathan Lake survived a dramatic second string battle against Lance Beddoes, coming back from two games down to beat the 17-year-old Kiwi 10-12, 7-11, 11-3, 11-9, 11-5. Eleventh seeds New Zealand stormed into the quarter-finals of the Men’s World Junior Team Squash Championship after defeating Venezuela 3/0 in the first day of knockout action in the World Squash Federation event in the Ecuador capital Quito. Bryce Redman was first on court and made short work of Wilfredo Arcia, winning 11-4, 11-2, 11-6. Paul Coll then accounted for Venezuelan number one Daniel Prato 11-6, 11-5, 10-12, 11-6, leaving Lance Beddoes to mop up the dead rubber 11-0, 11-1 against Alejandro Suarez. Already guaranteed to record their best finish since 2004, New Zealand will now face third seeds England in the last eight. England, winners of the title for the fourth time ten years ago, beat British rivals Wales 3/0. Egypt and Pakistan, expected to face each other in the final for the fourth successive time, eased into the last eight. Top seeds Egypt defeated Colombia, the 15th seeds, 3/0 – while second seeds Pakistan conquered Korea, the 16th seeds, by the same margin. Germany also exceeded their seedings to make sure of a top eight finish. The ninth seeds beat former championsAustralia, the tenth seeds, 2/1. Making only their fourth ever appearance in the Men’s World Junior Team Squash Championship, Venezuelaensured a top 16 finish for the first time after upsetting South Africa in the final qualifying round of the World Squash Federation event in the Ecuador capital Quito. South Africa, the 12th seeds, took the lead against 17/24 seeds Venezuela when squad number one Paul Rodrigues beatDaniel Prato in straight games in Pool E.
But after it was realised that South Africa had lodged an incorrect team order, the remaining two matches were handed to Venezuela – leaving the 12th seeds the ignominy of a finish outside the top 16 for the first time since 1998, and Venezuela the chance to achieve their best ever result. New Zealand also exceeded their seeded expectations after beating sixth seeds Mexico 2/1 in Pool F. Paul Coll gave the 11th seeds the best start with a 6-11, 11-6, 6-11, 11-8, 11-5 win over Mexican Miled Zarazua. Mexico fought back whenMario Yanez beat Kiwi Michael Sunderland in four games – then Ricardo Lopez took a 2/0 lead in the deciding match. But Lance Beddoes is made of sterner stuff. The 17-year-old from Auckland battled back to draw level, before clinching the deciding game to beat Lopez 6-11, 3-11, 11-6, 11-9, 11-8 and put New Zealand into a commanding position in the last 16 play-off line-up. 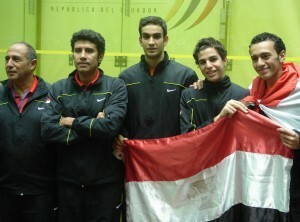 After claiming gold, silver and bronze medals in the individual competition, favourites Egypt made a powerful start in theMen’s World Junior Team Squash Championship with two 3/0 victories on the opening day of qualifying action in theWorld Squash Federation event in the Ecuador capital Quito. Led both times by individual championship runner-up Ali Farag, Egypt brushed aside Ireland and South Korea to ensure a winning finish in Pool A. Third seeds England also began well, storming to 3/0 wins over Kuwait and Netherlands in Pool C.